While those questions began as a rhetorical springboard, I would like to revisit them here, slightly reformulated, as points for earnest reflection. If, for the improviser, music is fundamentally unscripted – or unscriptable – why would she compose or perform with notation at all? 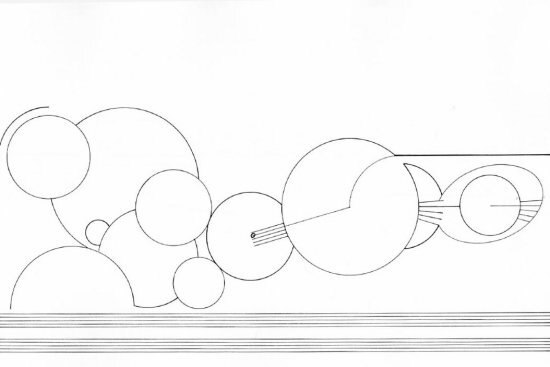 To address this important if somewhat unwieldy question, I turn to Cornelius Cardew’s monumental 193-page graphic score Treatise (1970, composed 1963-1967). Its long historical shadow, and the variety of ways performers have dealt with its notation, make it uniquely suited for such an inquiry. In examining Treatise‘s performance history from within a creative project, I will attempt to reveal some of the traits that lend it magnetism for so many improvisers, and extrapolate a few principles regarding what can make notation relevant for improvisers in general. Treatise is one of the few scores for improvisers that might be considered “standard repertoire” in experimental music. In contrast to most of the pieces included in Tactile Paths, it enjoys a rich and diverse performance history, mainstream publication by C.F. Peters, and substantial critical and scholarly attention. That it may be considered canonical is, however, ironic; the score is deliberately incomplete. Whereas semantic vagaries in many scores for improvisers lacking conventional notation2 or comprehensive written legends can be partially resolved by consulting the composer or performance practice, Treatise makes a feature of, and perhaps depends on, interpretive murk. Not only must a player decide how to interpret the notation at the molecular level; she must, in the context of an ensemble realization, negotiate its implementation with others, either verbally during rehearsal, on the fly during performance, or both. These three levels of interpretation may, and often do, contradict each other.3 In addition, the various notational elements (save the empty staves at the bottom of every page) enter and exit sections of the piece capriciously. Their visual-semiotic meanings change frequently, as for example when a circle acts as a geometric motif on one page, and becomes a musical note on the next. Sooner or later, any consistency in the interpretation of a given element is therefore undermined. Nonetheless Treatise is alive and well, “sow[ing] ‘wild oats’ […] even more than in similar compositions” (Anderson 2006, 317) of its age and genre, in the words of musicologist Virginia Anderson. In addition to its regular concert appearance and many recordings, it is often taught in university courses and workshops throughout Europe and the US.6 Particularly since 1999 – a period in which most of its commercial recordings were released – it has also undergone a critical renaissance7 and appeared in several score exhibitions.8 It may be surmised that Treatise – despite itself – is a referent in experimental music. Inspired by this tension between a panoply of paradoxes within the score, and a dazzling legacy without, I began my study of Treatise with the following question: how and why have so many musicians performed the piece? The subject of the present text, a feature-length radio piece entitled A Treatise Remix, represents an attempt at an answer. It did not resolve the question above once and for all: I cracked no hidden code in the score, nor did I discover any magical thread uniting Treatise‘s performance history. Indeed making A Treatise Remix revealed far more about my own assumptions and methods than about Treatise per se. However as I hope to show, Treatise‘s unique ability to catalyze such self-discovery, a multi-tiered process of improvisation, may be the key to understanding its enduring relevance and appeal. A Treatise Remix began with the aim of audibly comparing and contrasting a wide cross-section of Treatise recordings – their styles, self-imposed rules of interpretation, instrumentations, and so on. The format chosen for this comparison was a studio-assembled collage containing multiple recordings of selected pages sounding simultaneously. By layering diverse interpretations in this way, I intended to sketch a picture not only of particular performances’ relationships to the notation, but also of those performances’ relationships to each other. From here, I hypothesized, one might begin to theorize the gaps between notation and performance that Treatise so relentlessly interrogates. I began by collecting a library of fifteen commercial recordings, six archival and broadcast recordings, and a few dozen more published online.9 (Ultimately a total of twenty recordings were used; they are listed in Source Material.) The library encompassed a vast stylistic breadth, spanning relatively straightforward chamber music realizations, digital sonifications of the entire score, atmospheric post-rock and noise renderings, and free jazz satire. Given this unruly tangle, my initial strategy to layer them in a meta-interpretative collage was bound to be messy. To keep the mess to a minimum, the collage would be held together by musical events or qualities shared between different recordings; audible interpretive trends would, ostensibly, provide the listener a structural thread throughout the piece. Had my goals been of an archival or taxonomical nature, such connections and their systematic scrutiny might have provided the basis for an entire dissertation alone. But my inquiry was artistic rather than scientific, and shortly after beginning this intermediate step, I realized my attention would be far more fruitfully directed toward understanding the differences between recordings. These were richer and greater in number, and, as I will explain, they crippled my initial strategy for the collage. Furthermore, they provided a key to answering my questions about improvisers’ motivations and mechanisms for employing and perfoming notation. Two lines of difference brought this discovery to a fine point. Among the source material there is a wide spectrum of fidelity to the notation as symbols for sound production – from the literal to loose, and everything in between. At the literal end we may begin with Shawn Feeney’s digital sonification. Indeed one hesitates to call it an interpretation; rather than assign rules to the score as the basis for performance, Feeney feeds digital image files of the entire score through a computer program that reads the pages as bit maps. As Feeney explains, “Sine waves are generated from the black areas of the score as it scrolls from right to left, with the y-axis corresponding to pitch” (2002-2016). Each page has an equal duration of ca. 5″; the sonic mapping undergoes no changes. Among human performances, Vocal Constructivists’ (henceforth VC) crisply conducted a cappella interpretation is perhaps the most strictly symbolic. Like Feeney’s computer, the performers interpret the vertical axis of the page registrally, and the horizontal axis temporally; rough proportion in these parameters is maintained throughout. They also assign particular types of sounds (hissing, phonemes, clapping, etc.) to shape classes, and often dynamics to size. These materials and occasional text appear to be precisely and consistently worked out before performance; it is safe to presume that the coordination of twenty-three voices would be otherwise impracticable. Right of center is the piece’s first complete recording, by a Chicago-based sextet of seasoned improvisers conducted by Art Lange. This interpretation consistently respects the lifeline (which divides the ensemble orchestrationally – cello and clarinet above, piano and electronics below), numbers (which signify repeated tutti chords), circles (performed exclusively by the percussionist), and the rough left-to-right order of the symbols. Unlike VC, whose performers follow a common timeline given by the conductor, Lange’s musicians follow a more flexible timeline in which the exact orderings of most sounds (except the repeated tutti chords) do not correspond literally to the horizontal distribution of symbols on the page. Rather, symbols appear to be preassigned to particular musicians, and the relative durations of events in each player’s part (if not their order) is largely improvised. The sounds assigned to most symbols in the score – presumably also chosen by the players themselves – are less consistent and more context dependent, varying from page to page. These relatively minor variables render global coordination of parts within pages somewhat unpredictable. A palpably interactive discourse results from performers adapting their materials within the spontaneous polyphony. Versions by the 2:13 ensemble or Cardew’s 1967 BBC sextet, like most interpretations, fall somewhere in the middle of the spectrum. Here not all visual information in the score, apparently, is employed symbolically in performance. But the presence of some symbols remains audible, emerging and receding over time in function of the ongoing improvised musical development. Numbers and dots in both recordings, for example, often (though not always) represent repeated events and percussive punctuations respectively, acting as clear markers in a seemingly looser whole. Lastly, there is the most liberal end of the spectrum, including interpretations by guitar-and-poetry duo Léo Rathier and Méryl Marchetti, and indie rockers Sonic Youth with percussionist/ producer William Winant. These versions can be described as having an inspirational, atmospheric, or subjective connection to the score, with no apparent deferral to the concrete notated symbols. The word apparent should be underlined; as ever, it is impossible to say if the disconnection lies in the performance, in this listener’s (lack of) imagination, or both. Indeed from the middle toward the “less symbolic” end of the spectrum, it becomes increasingly difficult to support claims about the relationships between particular recordings and the score. When performances adopt a more consistent, literal approach to interpreting the notation, forensically inferring interpretive principles from the musical results is relatively straightforward. At any given moment in Feeney’s or Lange’s recordings, one can establish concrete relationships between musical events and marks in the score; the artists’ own written comments and page lists aid verification. However when an interpretive approach is more flexible or abstract, comparison can easily become a guessing game, particularly if no page numbers or artist comments are available. What I identify as a free improvisation, because I cannot recognize correspondences between visual symbols and musical events, may not necessarily be so; the rules of interpretation may simply be less obvious. Such cases would include numbers interpreted as seconds of silence instead of repeated chords, or John White’s mischievous interpretation of ascending visual lines as descending gestures in the BBC recording (which, unsurprisingly, I was able to identify only because of Cardew’s verbal anecdotes).12 Likewise, there is the obvious danger of losing one’s place in the score and misconstruing which symbols are or are not being played. This happened to me repeatedly when first listening to fast paced performances of many pages – even to strictly symbolic readings such as VC. Such methodological problems compounded the differences in symbolicity I initially sought to cut through; they increased the difficulty of carrying out my plan to base A Treatise Remix on interpretive trends. This became especially clear in my first practical experiments with the collage. Even when I was able to identify the beginning and end of a particular page in multiple recordings, substantial links among different interpretations were mostly circumstantial. The fact that two or three versions of a given page shared some interpretive trait X was no guarantee they shared any other qualities that could establish the thread I counted on finding in the fog. Conversely, qualities irrelevant to Treatise, such as recording artifacts or the simultaneous sounding of a particular instrument in different ensembles, tended to audibly link recordings much more clearly than interpretive content. The recorded material’s ostensible reducibility to symbols and their interpretation was overtaken by the irreducibility of “sound objects” in the musique-concrète sense. In my “analytical improvisation” then, contingency was already there even before I actively sought it out. This experience shares something with most of my subjects’ performances of Treatise: the principal that regardless of what one thinks might be under control, the musical facts may go their own way. Notation for the improviser is thus no guarantee of stability. Ellsworth Snyder’s solo piano interpretation – whose liner notes make no reference to page numbers, and which I was completely unable to align to the notation – contains two “parts” on separate tracks. Part One lasts 23″, and Part Two 19:40. 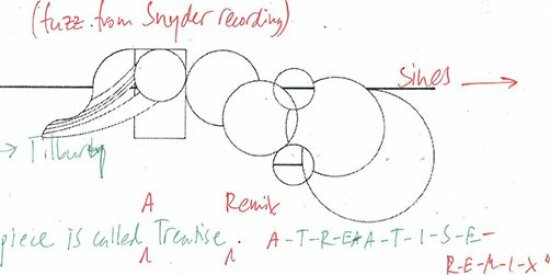 Why Snyder released these takes as such is a mystery, but the mere fact that a single player in a single recording session chose to make such a distinction is indicative of Treatise’s temporal malleability. Shawn Feeney’s digital sonification of all 193 score images with MetaSynth software lasts just over 15:00; each page has an identical length of ca. 5″. Lange’s chamber realization of the same pages occupies a full 2-CD set at 1:41:19, with varying page durations. Three chamber realizations of p. 1 – Cardew directing the American premiere, QuaX Ensemble, and Art Lange – last respectively 4:30, 3:30, and 2:00. The number 34 at the beginning of p. 1, interpreted in all three versions as sustained chords, lasts in each version 3:50 (17 iterations x 17″), 17″ (one iteration), and 50″ (7 iterations x ca. 7″). Although it is difficult to categorize these approaches, time is by no means an arbitrary or independent parameter in individual performances. 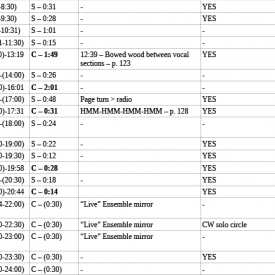 As I suggested in the previous section, the tempi of many recordings (defined by the duration of pages, rather than by pulse) are closely connected to the audible presence of their symbolicity. Extreme tempi, such as Feeney’s sonification of the entire score at 5″ per page or Mat Hannafin’s 16′ solo performance of a single page, tend to obscure the notation. Feeney’s reading moves too quickly and uniformly to make figurative details, subtle variations on shape classes, or scalar differences perceptible, even though they are represented literally. Hannafin’s 16-minute recording of p. 3 has the same blurring effect, but for the opposite reason. Due to the slow tempo, the physicality of his sustained circular rubbing movements on drum heads overshadows the correlation of symbols and events as such. Hannafin dwells within the circles on the page so long that the circle-ness of the page becomes a constant and recedes into the background. “Moderate” tempi are problematic to define since the score provides no tempo markings in the first place. However, in the Lange and the BBC recordings, symbols are easier to identify as gestures or discrete events within the musical discourse. One hears repeated events, percussive outbursts, and glissandi corresponding proportionally to symbols on the page. These tempi can therefore be considered to be moderate. Both the positive and negative effects of moderate tempi became clear to me when listening to Sonic Youth’s recording of p. 183. This performance is remarkable for its seemingly blasé non-engagement with the score, but entirely average in its duration of 3:27. Although I was unable to find any direct correspondences between the score and the interpretive content other than a short Luftpause toward the end, I continued to sense that what I was hearing could or should correspond because the pacing of the music was comparable with the density of visual information in the score: dynamics increase and the texture becomes thicker in the middle, with the aforementioned Luftpause before the coda. Evidence of the performance’s symbolicity was inflated by the moderate tempo, so to speak. All these shades of temporal complexity created second-order disjunctions – both between the recordings and between the collage and the score – in the process of layering recordings in my collage. Like the differences in symbolicity I mentioned in the previous section, these disjunctions posed a challenge to the original plans for A Treatise Remix. To understand how, consider the following test scenario. Three versions of p. 111 lasting 5″, 3:00, and 11:00 each contain a percussive attack corresponding to the dot at the beginning of the page. I wish to line up the three tracks so these attacks happen more or less at the same time, thus encouraging the listener to associate the interpretive commonality. This would render the following sequence: 5″ with all three layers at the beginning, 2:55 with two layers, and 8:00 of one version solo. The 11:00 version would thus arbitrarily become the focal point; moreover the resulting form would explicitly contradict the graphic qualities of p. 111, which grows in density halfway through the page. To compensate, should pp. 112-113 of the 3:00 version overlap a single page of the 11:00 version? Should the 11:00 version be left intact, edited, or not used because it creates too many complications? Should new versions of p. 111 lacking traits in common with the other three be introduced to reflect the parallel lines? Such questions reveal how the exercise of comparing Treatise recordings pointed directly back at my own assumptions and methods, rather than revealing the nature of Treatise itself. My own subjectivity in the observational process was so great that analysis could only be a prelude, rather than a basis, for my own realization of the score. The remainder of this text will thus concern itself principally with the realization of A Treatise Remix as a creative rather than comparative enterprise. But before leaving the survey behind, I would like to turn briefly to its broader impact on the remix; after all, my source material was not merely grist for the mill. Getting to know Treatise’s performance history was a formative process, from which I took away crucial lessons that laid the bedrock for A Treatise Remix. Perhaps in addition to shedding light on my own piece, these lemmas will also be useful for others who realize Treatise. All scores for improvisers are permeable; they let contingency in and leave aspects of their internal structure to the performer. But whereas pieces such as Malcolm Goldstein’s Jade Mountain Soundings or my Apples Are Basic offer the erstwhile performer at least a trace of the “spirit” in which a performance might proceed, even the most basic, general conditions for a performance of Treatise are enacted by the players. And as we have seen, there is no cohesive performance practice to supplement that radical contingency. Furthermore, aspects of particular interpretations such as symbolicity and time are difficult if not impossible to apply to other interpretations, as they are bound to each other within the situation and personnel of a given performance. Performances of Treatise are best undertaken and assessed on their own terms; grafting strategies or values from one interpretation to another is unlikely to bear fruit. With respect to my theoretical ambitions, the foregoing might be rightly called an admission of failure. Nonetheless, at the level of practice it offered me vindication and a clear foundational principle: do not defer to “tried and true” ideas or strategies – do it yourself. Affirming the relativism of Treatise in this way implies that any interpretative approach, any path through the piece, is in itself valid. I stand by this claim. But the same cannot be said of each realization; not all performances are equally convincing. A brief comparison of recordings by VC and solo pianist James Ede suggests why. With respect to symbolicity and time, both performances are similar. They take a comparably literal approach, reading the page from left to right and translating the vertical dimension of the page registrally. Both share a tempo of roughly three pages per minute and proceed along unified timelines (VC with the help of a conductor, and Ede alone). But the impacts of the two performances are strikingly different. On the one hand, VC take their approach to its logical extreme. By that I do not mean that they are fundamentalists; they frequently adjust the meaning of the symbols in context, e.g. by alternating between literal sonic mappings of visual lines à la Feeney, affective gestures, and texts derived from associations with visual figures. However they adhere to codes of translation long enough for the erratic nature of the visual material to render a consistent interpretation awkward or problematic. Such situations offer the performers an opportunity to stretch their interpretation and discover music beyond what the symbols suggest at face value. An example of this can be found in pp. 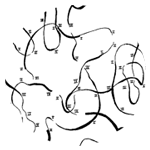 111-131, in which the translation of black and white circles (“Fa” and “wa”), vertical lines (claps), thin horizontal lines (nasal vowels), thicker ascending and descending lines (round glissandi), and other subtly differentiated symbols form a nonsensical, yet intriguingly virtuosic texture in constant variation. Had the interpretation focused only on the novel features of particular pages, this continuity, and consequently the surreal dramaturgy that carries the performance, would have been lost. Indeed the importance of maintaining rigor with one’s own decisions might be considered fundamental not only to the interpretation of Treatise, but to the performance of any notation for improvisers in which the meaning of the score is distributed among multiple parties. Taking responsibility for one’s own actions provides an antidote to the threat of a double-bind in which performers may hand over responsibility to the composer, whereas the composer has already assigned this responsibility to the performers. In such situations nobody is taking responsibility, and the result is unsatisfactory to everyone involved. Ironically Cardew makes no explicit reference to Treatise or notation in “Virtues”; he speaks of improvisation in general, and of his experiences with the improvisation collective AMM in particular. However as we just saw, this excerpt can also help us understand the dynamics of Treatise performances, even fairly codified ones such as the VC and Ede recordings. The fact that he includes these comments in Treatise Handbook at all is suggestive. Is improvisation always a factor in realizing Treatise with integrity? I would argue that when one is consequent – when a performance takes its interpretive terms to their limits – performers are bound to find themselves enmeshed in unforeseeable relationships to the score, to other musicians, to their own habits: “the scrambled crazy images of things recently seen” (Prévost 2011). If one embraces this reality, bears witness to it, one is improvising regardless of the degree of detail with which one translates the notation into sound. These are opportunities for transformation – we do Treatise in order to relearn “what we have in mind” and so change it through a dynamic connection with our environment. Taken together, these comments suggest that performances at the literal end of the symbolicity spectrum – those which emphasize the score’s “various parts” – do not engage in the kind of radical transformation Prévost and I value. For him, “moving forward” depends on a lack of preconceptions, on the spontaneity of real-time performance in which the models and experiments for interpretation are discovered. Symbolic preparation, by extension, constitutes an old pattern of thought that hinders this discovery. On the whole I share Prévost’s problem with “reductive”, or uncritical, approaches to the notation (e.g. Ede, or at the other end of the spectrum, Sonic Youth). However I take issue with the notion that a high degree of symbolicity is necessarily reductive, and thus precludes moving forward in the hunt. As in the case of VC, even a literal reading with little overt improvisation can produce a music of integrity that reinvents itself through notation in performance. The fact of examining and translating notation before performance does not diminish its urgency or speculative qualities. To be sure, Treatise allows for VC’s approach as well as Prévost’s; herein lies its unique potential. Likewise it admits Ede’s and Sonic Youth’s approaches; therein lies a possible vulnerability. In any case, it becomes hard to make formal judgements, as these will mostly be based on aesthetic preferences. The similarity of my own analytical work to Prévost’s experience of playing Treatise further breaks down this dichotomy of the symbolic and the real-time. Just as if I had been playing with a band, I immersed myself in the material, used the notation to engage with the sounds and players around me, and “mov[ed] forward […] to concoct new patterns of thought, which in turn dictate[d] the design of the models and experiments” (2011). Granted, that process took place over a longer period of time than a single performance, and my collaborators were not physically present (at least at this stage). But spontaneity is not all there is to improvising in Treatise; as Prévost himself acknowledges, “the hunter’s mind weaves ideas from old facts and fresh metaphors and the scrambled crazy images of things recently seen” (Prévost 2011, my italics). In a consequent performance, improvisation takes place at multiple levels, not only onstage. 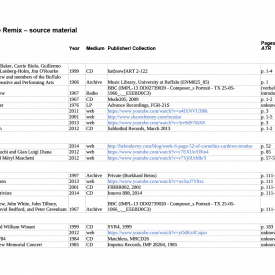 How did I weave among them in A Treatise Remix? I began with the score. Following Lesson 1, I resolved to commit to my own “reading” of the notation rather than defer to historical precedents or their structural commonalities. While the goal of the project required me to give the notation a certain protagonism, the nature of the collage format was incompatible with a strictly symbolic approach. Assigning symbols systematically to particular recordings or sound events would have been excessively formalistic, jeopardizing the all-important identities of and links between the different recordings. My solution was to zoom out, not focusing systematically on symbols and rules but rather on a story embedded in the progression of the notation from beginning to end. The “characters” in this “narrative” were the lifeline and the circles. A Treatise Remix treats it metaphorically, as a protagonist on a journey of self-discovery. 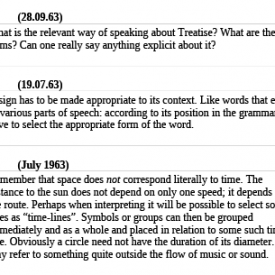 This reading stems both from Cardew’s comment that “Treatise is a long continuous drawing – in form rather similar to a novel” (1971, 117) and from personal observation. Flipping through the score from beginning to end, I see the path of a narrator drifting through relationships with shapes, figures, and numbers who come and go; traveling through natural, industrial, and psychological landscapes of all sorts; and, despite obstacles and momentary destruction, moving on. The straightness of this path is deceptive. If the journey were narrated from the outside, in third person, we would see twists and turns that the page could not contain. However in first-person, on the ground, there is only one direction: forward. Circles represent the Other, the counterpoint in this narrative. Whereas the lifeline travels across the page from left to right, the circles seem to stamp the page’s surface from above. 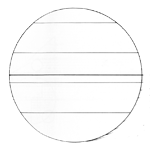 Whereas the line is in a state of continuous transformation, the circles suggest single self-contained objects. 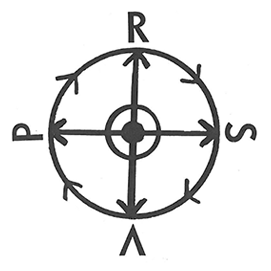 Not only are the circles different from the line – they often antagonize it. Their crowding, interrupting, and blistering begins in the second half of p. 1 and reaches a climax in pp. 114-141, where enormous black circles attempt to obliterate the lifeline altogether. This line-circle dialectic underlies A Treatise Remix‘s realization of pages in which the line is compromised or transformed, circles play an important role, or both. Section I (pp. 1-6; 0:00-12:12) offers an exposition. On p. 1 the line emerges and is interrupted by piano-shaped figure and a bubble cluster. It resumes in p. 2, where it meets and merges with a single circle. On p. 3 the line attempts to work around and is subsequently stymied by an expanded version of the cluster. In the middle of one of the cluster bubbles sits a musical note, whose staff line extends diagonally to the center of the adjacent bubble, then curves upward and continues in a thicker pen-width as the lifeline. This episode continues through p. 6 and ends at the emergence of a set of parallel staff-like lines, the beginning of a new episode not included in A Treatise Remix. Another manifestation of the commitment to develop my own reading was to play the score with other musicians. Given my aforementioned view that examining Treatise’s evolution from the outside was also a kind of performance, it seemed only logical to insert myself into the performative work more literally. In order to bridge the experiences of Treatise from the inside and the outside, I decided to interweave historical recordings of select pages with original interpretations. The hand-picked ensemble consisted of four Berlin-based musicians: Christian Kesten (voice, objects), Andrea Neumann (inside piano), Robyn Schulkowsky (voice, percussion), and myself (voice, contrabass). We had varying degrees of experience with Treatise. Kesten, despite being a veteran composer and performer of experimental scores, was unfamiliar with the piece. Neumann had played it a few times (including one intensively rehearsed concert with Keith Rowe). Schulkowsky had played and continues to play it regularly (often in the company of Treatise veteran Christian Wolff). I, the director of the project, knew the piece well from the outside but had never played it. We had all worked together in some capacity beforehand, but never in this particular quartet constellation; thus, a certain balance of compatibility and uncertainty was promised, both internally and with respect to the score. In addition to playing, I also resolved to integrate my own text. Although it had been my intention from the beginning of the project to use fragments of Treatise Handbook and other of Cardew’s texts on notation (1961; 1974), it became clear from my initial experiments with the collage that commenting vicariously on the discourse of the piece through the layering and temporal placement of Cardew’s words alone would not suffice. One solution was to splice original radio feature-style informative material with Cardew’s introductory text from a 1966 BBC radio broadcast of Treatise, such as you hear throughout the first twelve minutes. Another, which emerged as a proposal in post-production from producer Marcus Gammel, was to include informal descriptions of the visual appearance of the score. Translator and vocalist Kesten also recites such descriptions. As I briefly outlined in my description of Section I, the lifeline-circle narrative provided a cohesive way of selecting which pages of the score to realize. It was also applied to the more detailed organization of source material, live ensemble, and texts. In Section II of A Treatise Remix (pp. 111-141; 17:12-41:40), for example, symbols define which layers of material are present and when. If a circle is present on a given page, then the live ensemble plays. If circles are absent, then a fragment from Treatise Handbook is recited by Schulkowsky (English) and/or Kesten (German). If the lifeline is intact on a given page, then the tape collage15 sounds continuously. If the lifeline is broken or transformed, then “slices” (isolated and/or audibly edited fragments) of the tape collage are used. If the lifeline is absent, then no tape sounds. These rules result in a contrapuntal ebb and flow between the layers. Hence on p. 111-113 (17:11-21:26) a continuous tape collage is heard, with text on p. 111 (17:17-17:38) and p. 112 (19:15-19:49). On p. 113 while the tape collage is sounding, the live ensemble plays. On p. 114, there is only text, and on p. 115-116 only live ensemble. Crucially, this mapping did not define sounding results, but rather boundaries for situations in which I or the ensemble made context-dependent decisions. In this sense the ordering, density, and durations of source material in the continuous tape collage on p. 111-113 began as a completely open question. Because there were several recordings of these pages, three of which (FORMANEX, WhoThroughThen, Cardew BBC) were individually dense, I chose to leave time for different recordings to emerge without overcrowding one another, using the graphical elements to suggest rough changes of overall density and volume. Within this thick texture, the live ensemble was indicated to play p. 113; so as not to immediately lose our identity within the tape collage, we collectively decided to perform only the circles. Since there was no tape present on p. 113, it seemed wise to play all the symbols on that page, each performer choosing which ones to play and in which order – except the circles, which we played together on cue. An “improvised” secondary rule thus grew spontaneously out of a performative contingency: if a circle is present and the lifeline is intact on a given page, the live ensemble plays only the circles. The meaning of the notation grew in constant feedback with the individual elements to which it referred in a variety of ways. The temporal structure (like Treatise itself) was not simply an a priori container to be filled with inert material – it was a dynamic, ad hoc creature that both emerged from and transformed the process of mixing the collage and working with musicians. Another simple but significant case of this feedback was the inclusion of particular pages in Section II. They were chosen not only according to the line-circle dialectic, but also according to which pages were played in available recordings and those recordings’ mutual compatibility. Following my criterion to include only pages in which the line is compromised or transformed, circles play an important role, or both, Section II would have technically started at p. 113. However three of the five recordings that included material from these pages happened to begin on p. 111; they also contained vocal material, a useful way to bind the identity of the section. Thus I included pp. 111-112, despite the fact that they did not fit the original plan. For reasons of density described above, this section lasts for 4:15, an unexpectedly substantial part of Section II. Before and after Section II, the form contains two intermezzi and four solos. The nature of these sections emerged quite late in the process of assembling A Treatise Remix; rather than forming part of a centralized plan, the sections themselves were also a consequence of negotiating material, form, and performer choice – a long-term improvisation also implicit in the page selection. The intermezzi (I –12:13-15:37; II – 41:41-43:46) are played exclusively by the live ensemble, with no text or tape collage. Our interpretation of the notation in the intermezzi was more uniform and tightly choreographed than in Sections I and II, which are characterized by greater flexibility and individual timelines; each performer chose and prepared specific symbols à la VC. This precise interpretive strategy was arrived at collectively during rehearsals. Although the content is less “improvised” in the moment of performance than Sections I and II, the emergence of the approach, as well as the specific distribution of tasks on each page, represent a kind of organizational improvisation somewhere between my improvisation with the tape collage, and the ensemble’s performance in the studio. In addition to playing our instruments, we play back samples of Treatise recordings whose pages fall outside the line-circle narrative, sounded through instruments of each player’s choice. Kesten used a CD player amplified through a tin bottle, Neumann used a digital recorder amplified by pickups on her self-designed inside-piano instrument, Schulkowsky used a noisy, semi-functional cassette recorder, and I used a hand-held radio tuned to a mini-FM transmitter. These instruments were selected completely ad hoc, and techniques for playback had to be learned during the rehearsal process. Our tenuous fumbling around for buttons combined with the thin, silly sounds of the playback come to define the intermezzi over and above our interpretation per se; the situation speaks louder than the structure. With this comment, we come full circle: in the end, does the arbitrary prevail? Is Treatise ultimately … empty? Had I limited my study to extant recordings and the discourse around the piece, I would have most certainly answered in the negative. So many provocative, and occasionally beautiful, recordings and discussions have arisen from the score that one can hardly deny its power, at the very least, to inspire. But I also experienced Treatise from the inside, and the fact is that my defining comment on this journey appeared to support the skepticism of Tilbury, Prévost, and Barrett which I questioned in the introduction. Frankly, hearing myself call an empty page the heart of the piece surprised me. What to make of this? One can take my surprise itself as a measure of the score’s success. It serves as a prime example of Treatise’s ability to induce and test the performer’s commitment to reworking her methods and assumptions through the empirical contingencies of performance. I recall here Cardew’s point 2 from “Towards an Ethic of Improvisation”: “What we do in the actual event is important – not only what we have in mind. Often what we do is what tells us what we have in mind” (Cardew 1971, 132). In the process of realizing A Treatise Remix I not only learned the score of Treatise – I also relearned and perhaps even de-learned myself. In this vein, my use of the word “empty” should be retroactively qualified; Treatise’s semantic and material emptiness is insurmountable, but at the same time dynamic. Its internal richness sets us performers on a hunt, and its absence of ideological or sonic content routes that hunt right back to us. If we bring the content, rather than finding it along the way (the way being not only real-time performance, but all the preparatory and reflective labor with which it is continuous), the hunt ends before we reach ourselves. If however we accept the challenge to “give of [our] own music in response to [Cardew’s] music, which is the score itself” (Cardew 1971, 113) – as Tilbury, Prévost, and Barrett have done time and again in spite of their skepticism – performing has the potential to become “a voyage of ‘self-invention’” (Tilbury 2008, 236). Gary Peters, in contradistinction to many improvisation scholars, has argued for the importance of the work in (free) improvised performance, and against assigning (inter)subjectivity undue weight: “The care for the work, one that overrides the more trivial concerns of intersubjectivity, is a care for the work’s beginning, not its end; as such, it will be ever ready to destroy the work in an attempt to preserve what Heidegger describes as the openness of that beginning” (2009, 51). In Treatise, the distinction is turned on its head; a voyage of self-discovery is neither incidental nor a telos in itself, but rather an ineluctable consequence of performing the piece with integrity, whatever that may mean for each performer. This may be the reason both for Treatise’s popularity and perpetual freshness, and for its emblematic status among notation for improvisers as a whole. The title refers to Cardew’s own Treatise Handbook (1971), a volume consisting principally of cogitations on Treatise‘s composition and early performances. Having reluctantly assembled the Handbook at the behest of Treatise‘s publisher C.F. Peters, Cardew openly disparages Peters’ request for a performance guide; he proceeds to offer the reader a diary of doubts, questions, associations, and occasional moments of lucidity from within the arduous creative process, along with descriptions of how and by whom the piece happened to be played in particular concerts. Instead of explaining the piece or telling putative performers how it should be played, these reflections and anecdotes activate the performer’s imagination by example, and they typify a kind of wayfinding that saturates Treatise on many levels. In both the present text and in A Treatise Remix, I have attempted to follow in Cardew’s slippery tracks. All right-justified quotes are taken from Treatise Handbook. Recordings of group rehearsals of Treatise published in Sound American 12 (Wooley 2015a, 2015b) bear this out abundantly. See excerpts from Treatise Handbook inserted throughout this text. E.g. Ming Tsao’s seminar at the University of Gothenburg (Spring, 2015), [MUSC116] at Wesleyan University (Spring 2013), Christopher Hobbs’ music technology class at De Montfort University (late 1990s – see Anderson 2006), or Anthony Coleman at the New England Conservatory of Music (2015 – see Wooley 2015a). See Anderson 2006; Prévost 2007; Tilbury 2008, 227-277; Wooley 2015d. See Ashwal et al 2001; Waterman et al 2007; and Held and Subirà 2008. Since my aims were analytic and creative rather than archival, the discographical research was far from systematic. My principal sources were John Tilbury’s Treatise discography (Tilbury 2008, 1049-1050), comments on particular versions in assorted publications (Cardew 1971; Anderson 2006), a network of resourceful colleagues, a helpful producer (Marcus Gammel), and of course the internet. Feeney (2001) and Horvath (2012). This poetic coincidence may have a mundane explanation: according to Feeney, who did not know about Horvath’s version before I asked him about it, Horvath took Feeney’s version without asking, time-stretched it, added distortion, and called it his own without crediting Feeney. Given the dates of publication and the recordings’ resemblance, plagiarism seems plausible. To be fair, Ede was a student when he made this recording and posted it on YouTube. I do not mean to denigrate his innocence; I simply wish to show that “accuracy” is an insufficient barometer of success in any performance of Treatise. No actual magnetic tape was used in production. Henceforth I use the word “tape” to denote the fixed media collage of historical recordings. Anderson, Virginia. 2006. “‘Well, It’s a Vertebrate…’: Performer Choice in Cardew’s Treatise.” Journal of Musicological Research 25 (3–4): 291–317. Ashwal, Gary, David Feldman, Kim Eugene Mikyung, Chung Soojin, Evan Malsbury, Sheetal Prajapati, and Samsurin Welch. 2001. “Treatise - Cornelius Cardew - An Animated Analysis.” http://www.blockmuseum.northwestern.edu/picturesofmusic/pages/anim.html. Cardew, Cornelius. 1961 (2006). “Notation – Interpretation, Etc.” In Cornelius Cardew: A Reader, edited by Edwin Prévost, 5–22. Essex: Copula. ———. 1970. Treatise. London: Hinrichsen Edition, Peters Edition Limited. ———. 1971 (2006). “Treatise Handbook.” In Cornelius Cardew: A Reader, edited by Eddie Prévost, 95–134. Essex: Copula. ———. 1974 (2006). “Stockhausen Serves Imperialism.” In Cornelius Cardew: A Reader, edited by Eddie Prévost, 149–227. Essex: Copula. Feeney, Shawn. 2002. “Cornelius Cardew’s Treatise: Realization | Shawn Feeney.” 2016. http://www.shawnfeeney.com/projects/treatise/. Held, Barbara, and Pilar Subirà, eds. n.d. Possibility of Action. The Life of the Score. Barcelona: Museu d’Art Contemporani de Barcelona. Prévost, Eddie, ed. 2006. Cornelius Cardew: A Reader. Essex: Copula. Prévost, Edwin. 2009. “Free Improvisation in Music and Capitalism: Resisting Authority and the Cults of Scientism and Celebrity.” In The Ashgate Research Companion to Experimental Music, edited by James Saunders, 131–44. Farnham: Ashgate. Tilbury, John. 2008. Cornelius Cardew (1936-1981): A Life Unfinished. Essex: Copula. Waterman, Alex, Debra Singer, and Matthew Lyons, eds. 2007. Between Thought and Sound: Graphic Notation in Contemporary Music. New York: The Kitchen. Wooley, Nate. 2015a. “Anthony Coleman and Survivors Breakfast Explore Treatise.” Sound American 12. http://soundamerican.org/sa_archive/sa12/sa12-the-treatise-performances.html. ———. 2015b. “Mostly Other People Do The Killing Are Detained By Treatise.” Sound American 12. http://soundamerican.org/sa_archive/sa12/sa12-the-treatise-performances.html. ———. 2015c. “Richard Barrett On Treatise And Improvisation.” Sound American 12. http://soundamerican.org/sa_archive/sa12/sa12-eddie-prevost-and-richard-barrett-on-treatise.html. ———. 2015d. “The Treatise Issue.” Sound American 12. http://soundamerican.org/sa_archive/sa12/index.html.